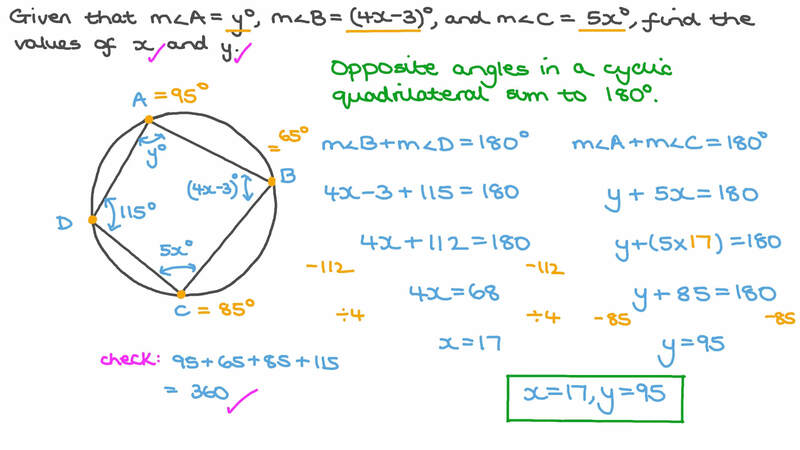 In this lesson, we will learn how to identify whether a quadrilateral is cyclic and use cyclic quadrilateral properties to find a missing angle. In cyclic quadrilateral 𝐴 𝐵 𝐶 𝐷 , if 𝑚 ∠ 𝐶 = 1 2 1 ∘ , what is 𝑚 ∠ 𝐴 ? Is 𝐴 𝐵 𝐶 𝐷 a cyclic quadrilateral? Given that 𝐴 𝐵 𝐶 𝐷 is a cyclic quadrilateral, find 𝑚 ∠ 𝐵 𝐴 𝐶 . Find 𝑚 ∠ 𝐵 𝐶 𝐷 . Find 𝑚 ∠ 𝐵 . Find 𝑚 ∠ 𝐸 𝐶 𝐹 and 𝑚 ∠ 𝐴 𝐵 𝐹 .
𝐴 𝐵 𝐶 𝐷 is a cyclic quadrilateral with 𝑚 ∠ 𝐵 𝐴 𝐶 = 5 8 ∘ and 𝑚 ∠ 𝐴 𝐷 𝐸 = 8 7 ∘ . What is 𝑚 ∠ 𝐵 𝐶 𝐴 ? Is the quadrilateral 𝐴 𝐵 𝐶 𝐷 cyclic? Given that 𝑚 ∠ 𝐷 𝐶 𝐻 = 9 2 ∘ , 𝑚 ∠ 𝐵 𝐴 𝐷 = 4 𝑥 ∘ , and 𝑚 ∠ 𝐶 𝐷 𝐴 = 2 𝑦 ∘ , find 𝑥 + 𝑦 . In a cyclic quadrilateral 𝐴 𝐵 𝐶 𝐷 , if 𝑚 ∠ 𝐴 = 3 𝑚 ∠ 𝐵 = 2 𝑚 ∠ 𝐶 , find 𝑚 ∠ 𝐷 . Given that 𝑚 ∠ 𝐴 = 𝑦 ∘ , 𝑚 ∠ 𝐵 = ( 4 𝑥 − 3 ) ∘ , and 𝑚 ∠ 𝐶 = 5 𝑥 ∘ , find the values of 𝑥 and 𝑦 . Calculate the values of 𝑥 and 𝑦 . In the figure, 𝐴 𝐵 𝐶 𝐷 is a quadrilateral with 𝑚 ∠ 𝐴 𝐵 𝐶 = 1 1 7 ∘ and 𝑚 ∠ 𝐴 𝐶 𝐵 = 3 2 . 5 ∘ . What is 𝑚 ∠ 𝐵 𝐷 𝐶 ? Given that 𝐴 𝐵 𝐶 𝐷 is a cyclic quadrilateral, 𝑚 ∠ 𝐴 𝐶 𝐵 = 7 0 ∘ , and 𝐴 𝐵 = 𝐴 𝐶 , find 𝑚 ∠ 𝐵 𝐷 𝐶 . 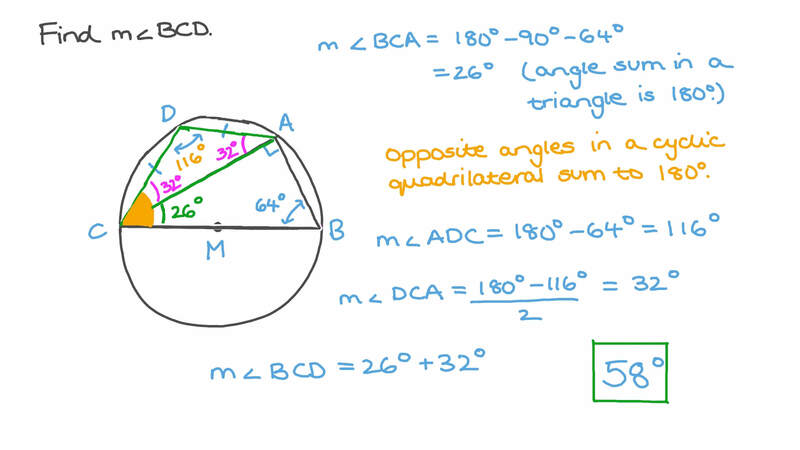 Find the remaining internal angles of quadrilateral 𝐴 𝐵 𝐶 𝐷 . Find 𝑚 ∠ 𝐸 𝑀 𝑁 , given that 𝐿 𝑀 𝑁 𝐸 is a cyclic quadrilateral with 𝑚 ∠ 𝑀 𝐿 𝐸 = 6 4 ∘ and 𝑚 ∠ 𝑀 𝐸 𝑁 = 3 8 ∘ . If 𝐴 𝐵 𝐶 𝐷 is a cyclic quadrilateral, where 𝑚 ∠ 𝐵 = 5 4 𝑚 ∠ 𝐷 , find 𝑚 ∠ 𝐵 . Work out the size of . Is there a circle passing through the vertices of the quadrilateral 𝐴 𝐵 𝐶 𝐷 ? In the figure below, 𝑚 ∠ 𝐴 𝐷 𝐸 = 2 6 . 9 ∘ , 𝑚 ∠ 𝐴 𝐸 𝐵 = 8 2 . 9 ∘ , and 𝑚 ∠ 𝐴 𝐵 𝐸 = 5 9 . 1 ∘ . Is 𝐴 𝐵 𝐶 𝐷 a cyclic quadrilateral?